A neo-Hitchcockian turducken of slapdash, would-be intrigue, Private Number is the sort of movie that would rather invite (and, indeed, probably accept) all manner of ridicule rather than be accused of being boring. So perhaps on some meta-level of its own devious and meticulous crafting, this independent psychological horror film “works,” if only because one spends no small amount of its running time trying to piece together a reasonable working theory about what the hell might be going on. A melange of paranoid identity crisis character study, murder mystery, possession thriller and domestic drama that also determinedly weaves in a serial killer twist, Private Number has a couple interesting if somewhat shopworn ideas, but over-dials its plotting and refuses to exist in the state of cool menace its narrative requires. Michael Lane (Hal Ozsan) is a recovering alcoholic and author suffering through the requisite struggles with his second novel. While his wife Kathy (Nicholle Tom) is generally supportive, her desire to get pregnant is exacerbating Michael’s stress. Then a series of midnight crank phone calls (“Remember me?”) and other odd occurrences add to the couple’s tension and unease, as does a visit from a couple of friends (Morgan Peter Brown and Anastasia Roussel) with their child. In one of the earliest bits that punctures the notion of any significant and lasting chilly vibe, Michael begins having visions of a knight (like, a literal knight in armor), one of the pivotal characters from his first novel. Mainly because of the phone calls, Michael and Kathy summon law enforcement, in the form of Sheriff Garrett Stance (Judd Nelson), but he’s a dickbag for seemingly no reason, and blows off their concerns. The movie than awkwardly pivots into investigatory territory, with Michael discovering information about a string of old murders. Naturally, in sifting through the blend of facts and speculation, he intuits first that this is all connected to his current situation, and next that Sheriff Stance might be hiding something even more sinister. Written and directed by the fantastically named LazRael Lison (who probably never experienced the adolescent excitement of getting one of those personalized keychains or mugs), Private Number is suffused with a fumbling, hands-on nervousness that stands in opposition to what is interesting about its story. The movie’s numerous progenitors (Lost Highway, certainly, as well as Secret Window and any number of domestic two-handers from the 1990s indie scene) encompass a lot of different styles and genres, but share something lacking here: restraint. Lison gives up the ghost fairly early on, long before Private Number becomes utterly bogged down in a third-act slog. Flashes of inanity mark the script as not exactly unerring in its attention to detail or character fidelity, as when Michael starts babbling incoherently and Lison has Kathy get agitated and exclaim, “You’re insane!” before even questioning whether her husband has fallen off the wagon and had a drink. Lison also refuses to let any one moment of anxiety linger, instead preferring to pile on incident after incident. It’s a self-defeating tack. 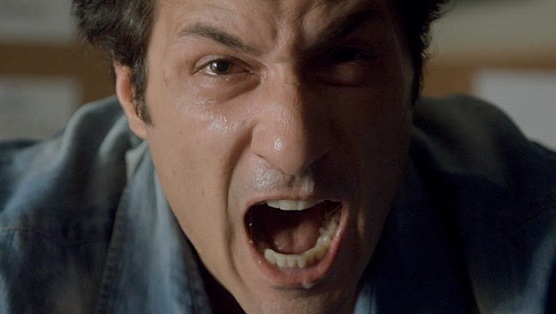 If there’s any glue present, it comes mostly in the form of Ozsan, who has a more intriguing character, certainly, but also delivers a more nuanced performance than Tom, who merely plays emotional beats and not a real person. Also, Tom Sizemore gives a nicely relaxed turn as Michael’s AA sponsor Jeff, including the high point of a monologue that may or may not be rooted in personal experience. In the end, though, Private Number is too concerned with trying to pile intrigue on top of intrigue to deliver believable characters or real suspense. Its technical credits, too, are cramped and shot through with a certain genericness, lacking both scope and a unifying vision. Cinematographer Daniel Marks trades in boxy compositions, and while composer Harold Squire actually delivers a score with a fairly significant range, he really overdoes the emotive goosing. One shouldn’t answer a call from this Private Number. Brent Simon is a longtime entertainment journalist and sworn enemy to auto-play website videos, as well as a member of the Los Angeles Film Critics Association. You can follow him on Twitter.